Back pain is one of the most pervasive disorders in the United States. Around 80 percent of adults struggle with lower back pain some time in their life. If you have a job that requires you to stand all day, you may develop back pain that ranges from mild pangs to severe discomfort. Your back’s anatomy is designed to support the weight of your upper body while you stand. The back is made up of vertebral bones with round, rubbery pads called discs between each which act as shock absorbers. Add to this the ligaments, tendons and thirty-one pairs of nerves, and there’s a lot of different parts that can go wrong and cause pain while you’re standing. Stress on your back from poor posture is the most common cause of back pain for people who stand at work all day. It creates increased pressure on your spine that makes lower back muscles tighten and then spasm, which causes pain. However, your lower back sees a lot of action every single day. From bending to moving around, it’s the most used part of your spine, making it susceptible to injury and wear and tear over time. If you’ve developed a spinal condition, standing can aggravate inflammation increasing lower back pain. Back pain is one of the leading causes of missed work days. If you struggle with back pain while standing, don’t let it make you miss one more day of work. 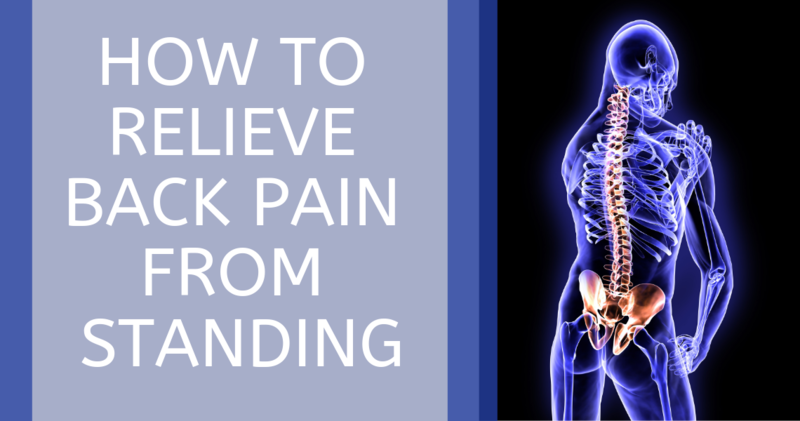 Here are some tips on how to relieve back pain caused by standing all day. Move Around: Moving will help improve circulation in your spine and reduce muscle fatigue. Take Breaks: Taking frequent breaks to get off your feet will help reduce fatigue and discomfort to your spine. Proper Posture: Good posture is one of the best ways to prevent back pain if you have a job that keeps you on your feet. Keep your weight primarily on the balls of your feet and bend your knees slightly. Stand straight and tall and pull your shoulders back letting your arms hang naturally to your sides. Don’t push your head forward or let it drift backward or to the side. Shift Your Weight: When standing for long periods of time, shift your weight from your toes to your heels or from one foot to the other. Lean: If there’s a solid support for you to lean against, this will reduce fatigue when standing. Another way to help prevent and even relieve back pain due to standing around on the job is by stretching. Stretches help loosen muscles, thus helping you get rid of existing back pain. However, it can also help prevent future back pain by improving your movement and increasing your back’s resilience and strength, which can lower your risk of back injury. Prayer Stretch: Also called the child’s pose, this popular stretch has you tucking your legs underneath yourself and sitting on your heels while bending forward at the waist. Extend your arms in front of you laying your palms flat on the floor and hold for 30 to 60 seconds. Repeat three to five times. Knee to Chest Stretch: Lie flat on your back with your legs fully extended. Place your hands behind your knee and pull your leg toward your chest. You can also place your hands on top of your knee or shin. Hold for 30 to 60 seconds then switch legs. Repeat three to five times. Pelvic Tilt: Lie flat on your back with your knees bent. You can either lay your arms beside you or put your hands behind your head. Tighten your abdominal muscles while pushing the small of your back flat against the ground. Hold this ab contraction for ten seconds, and repeat 10 to 20 times. Take over-the-counter pain medication like ibuprofen. Purchase a mattress that offers more back support at night. Use heat and ice when you get home. Avoid bending down too often, and try not to lift heavy objects. Lower back pain could be a sign that you have a more serious spinal condition. If you try these tips to relieve back pain while standing and it still hurts after several weeks, then it’s time to contact International Spine Institute. Our physicians specialize in finding the cause for your back pain and can help you come up with a treatment plan that works for you. This could include a minimally invasive procedure that will address your pain without the lengthy recovery time of other procedures.